+ The Right Reverend Rowan Williams, 104th Archbishop of Canterbury, lectures on the intersection of political discourse and theology and the role of the church to establish human personhood. 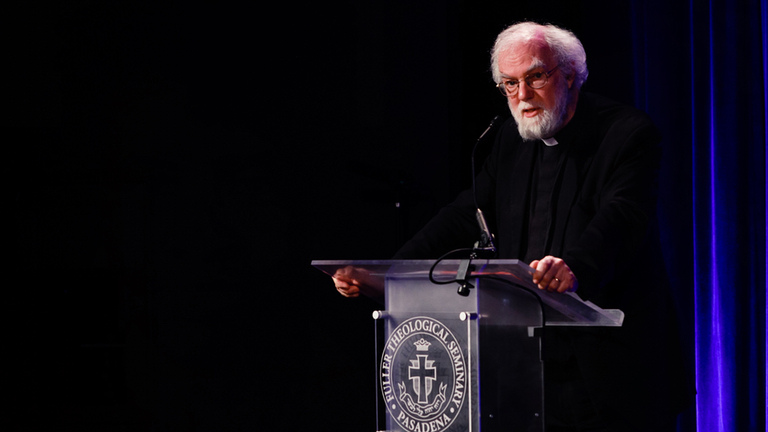 The Right Reverend Rowan Williams spoke at the 2018 Payton Lectures, an annual lecture series from Fuller Seminary’s School of Theology. Fuller Theological Seminary instituted the Payton Lectures in 1948, providing for a series of divinity lectures by a notable scholar outside the regular faculty. The lectureship is named for Dr. John E. and Mrs. Eliza Payton, parents of the late Mrs. Grace Fuller, wife of seminary founder Charles E. Fuller. Explore lectures, responses, and more here. + Sebastian Kim, executive director of the Korean Studies Center, responds to Rowan Williams’ second lecture by exploring worship, acting justly, and the complex global context for human rights. + Erin Dufault-Hunter, assistant professor of Christian ethics, responds to Rowan Williams’ second lecture by exploring the ways “human rights” have been used to support the powerful, Emmett Till, a Christian imagination that can resist the principalities and powers within our society.